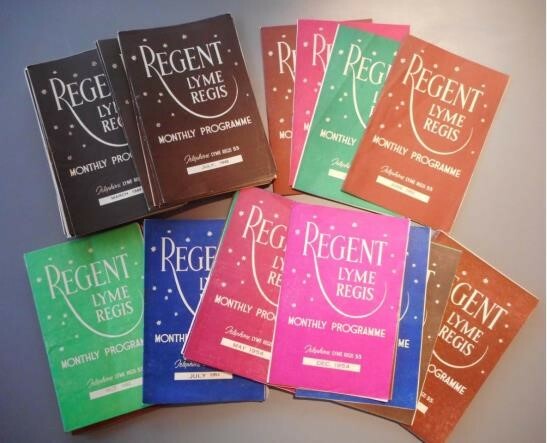 Members will be interested to hear about a collection of Regent Cinema programmes dating from 1948 to 1955, found in impeccable condition at a flat in Rickmansworth last year, is now the subject of a fascinating new display at Lyme Regis Museum. They were loaned by local resident Mrs Mary Howard in October when, co-incidentally, the Regent would have been celebrating its 80th birthday but for the fire which destroyed it two years ago. For the Museum’s marvellous research team they represented a cornucopia of information about the town during those post war austerity years, when the cheapest seat in the stalls would have cost 10 pre-decimal pence (8 pence plus 2 pence tax) and programmes could be posted (free! ): “Please give your name and address to the Manager.” Clearly someone then living in Rickmansworth took full advantage of this. Not surprisingly, there was an emphasis on British Films, with All Over the Town featured more than once. In addition to the colourful static display there is a wall-mounted TV on which it is possible to view a continuous showing of more items from the treasure trove of over 100 original programmes, including covers, inside pages, advertising and contents, plus classic stills - to be seen also on this page. Because the emphasis was on British films there may have been a few raised eyebrows when, in 1951, the X-rated “Clochemerle” came to the Regent. Canny advance publicity (the kind that sells tickets) included the comment “I stand amazed and delighted that the censor should have passed this film.” The writer was a columnist on the “News of the World”! For those who were there at the time, a richly evocative trip down memory lane. For others, a revelation of an innocent period in the life of the town, recorded in more vivid detail than any that could have been achieved by an academic historian of the period. For more on this story see the Chairman's comments here. The opening of the exhibition in Lyme Regis Museum, March 2018. 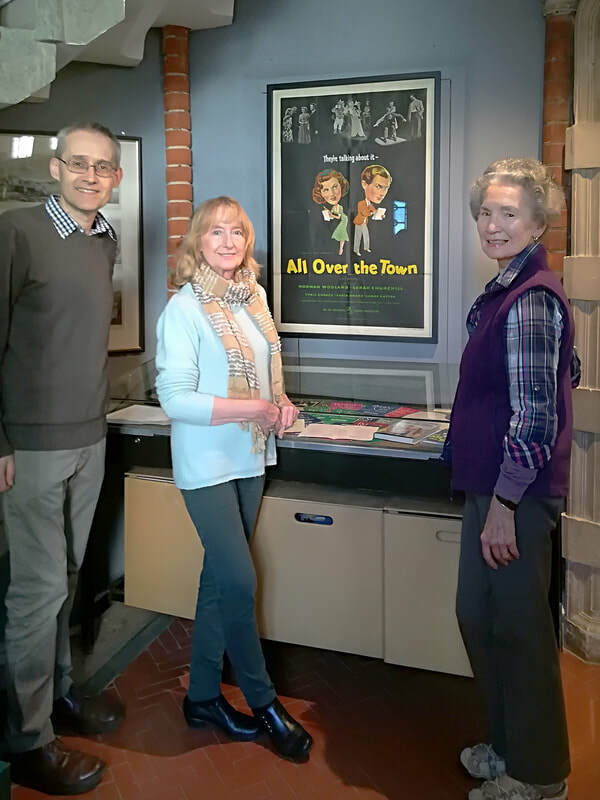 ​Museum Director David Tucker, donor Mary Howard, and Museum + Film Society Committee Member Margaret Rose.